Pastor Thomas Mark Gundermann: aka “Pastor Tom” is married to Amy (Schaffer, CSP class of 2000). Tom and Amy have three children: Kayla, Noah, and Eva, who all attend Central Lutheran School in Saint Paul. Together they enjoy biking, camping, and many and various musical and athletic activities. Amy and Tom met on Concordia’s campus in 1996 (Tom’s parents, by the way, met on Concordia’s campus in 1955). 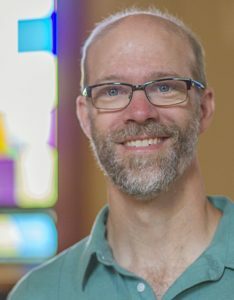 Pastor Tom is a graduate of Pilgrim Lane Elementary, Plymouth Junior High, Robbinsdale Armstrong High School, Valparaiso University, and Concordia Seminary, Saint Louis. After undergraduate work and before Seminary, Tom participated in a year of Youth Encounter and a year of Lutheran Volunteer Corp. The YE year brought him to West Africa where he witnessed the young Lutheran churches of Ghana and Nigeria. The LVC year was spent serving the immediate neighborhood where Concordia is located helping with literacy, recycling and gardening programs. Amy and Tom have served three congregations before coming to Concordia: Trinity First in South Minneapolis, Peace Lutheran Church in Robbinsdale, Minnesota, and Faith Lutheran Church in Penfield, New York. Tom’s interests include spending time with family, writing music and Biblical musicals, “free lance carpentry” around the house (a few blocks South of campus), and almost anything athletic (GO GOLDEN BEARS!) You can check out some of Tom’s music at tunesbytom.org . Shelly is a Director of Christian Education and alumna of Concordia University, St. Paul. 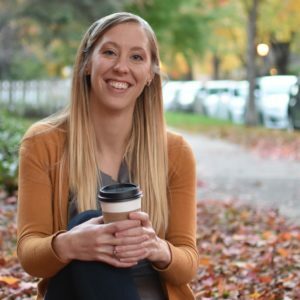 She grew up in small town Kansas, but loves calling the Twin Cities home. Shelly is also a Youth Encounter alum, traveling the east coast on Captive Free NorthEast 04-05. Shelly enjoys traveling, spending time with loved ones, coffee shops, ethnic food, live music, being outside, creative artsy things, being an auntie and godmama, and finding adventures of all kinds. She is a musician, speaker, and writer (check out her blog). Shelly says the best part of her job with CSP Ministry is introducing students to how good “life to the full” in Jesus can really be.